"You wanna shoot me, Marshal? You ain't fast enough, and my posse has a pyromaniac gadgeteer who's already aiming at ya. You ain't got the grit. You want me, I'll be travelling the owl-hoot trail.! - Calabash Twigg, orcish outlaw, part-time bounty hunter and a very bad man. 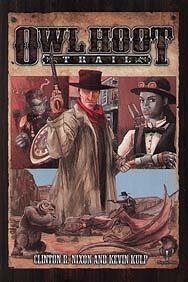 To ride the owl-hoot trail: to take up as an outlaw. Rules-Light, Western-Heavy and Full of Fantasy. Create and play characters in a hostile world where half'in gunslingers ride out with shee scouts and hill folk preachers to escape the law, where mentalists cheat you at poker and gadgeteers build gizmos to keep undead off the range. Using slimmed-down game mechanics you already know the Old West of your imagination just got a lot more dangerous.